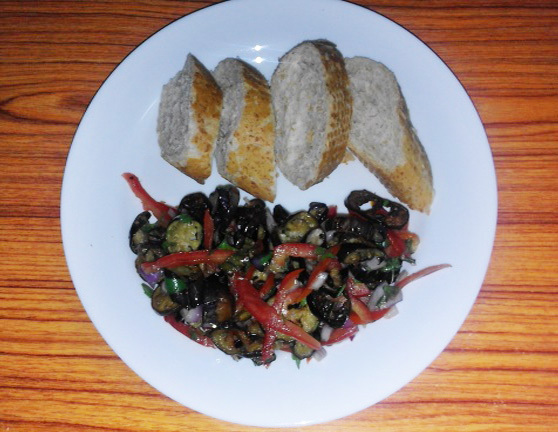 This succulent cooked aubergine, tomato and onion salad can be served with bread, rice, curry or dhal (lentil curry). Cut the aubergine into even slices, sprinkle with salt and let sit for 5 minutes. Wash the aubergine slices after 5 minutes. Fry the slices in oil until light brown in colour. Cut tomatoes in half, remove all seeds, and then julienne slice the tomatoes. Cut onions into small pieces and roughly chop the coriander. Mix all ingredients in a bowl, add vinegar and the remaining salt and serve.